ERA passage door knobs. For use on internal doors where no locking facility is required. 50mm diameter door knob on a 67mm diameter back rose. Supplied complete with fixings. Available in Polished Brassed, Polished Chrome & Satin Chrome finish. 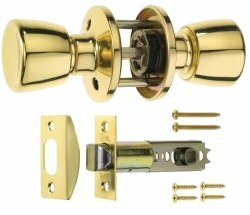 Supplied with all fixings and latch with adjustable back set, from edge of door to the centre spindle, of 60mm or 70mm.